Plow Digital and Plow Games will demo Last Front at the League of Xtraordinary Programmers event! But behind the scenes, Indy’s annual Gen Con convention has become a powerhouse in the growing $880 million international hobby game business—and a boon for homegrown gaming startups, including Plow Games. The article below was originally posted on ibj.com by the Indianapolis Business Journal, see the original article here. The wandering elves, Jedi gangs, live anime characters, and other costumed attendees get most of the attention. But behind the scenes, Indy’s annual Gen Con convention has become a powerhouse in the growing $880 million international hobby game business—and a boon for homegrown gaming startups, including Plowgames. “It’s the largest event for analog gaming in the world,” said Robert T. Carty Jr., vice president of sales and marketing for Mayfair Games, the Illinois-based company behind the breakout hit Settlers of Catan. The event, which is expected to draw 60,000 people from July 30 to Aug. 2, is a great spot for game makers to try new games, collect feedback and interact with passionate customers. Everyone at the show is a potential buyer, added John Ward, executive director of the Game Manufacturers Association. “It’s an opportunity for manufacturers to have a very targeted market,” he said. The principals from Plowgames will have to travel only a few blocks south for Gen Con, from their offices in the Stutz Building. Plowgames is a division of Plow Digital, whose bread and butter is designing electronic interactives for the likes of Volkswagen and HHGregg. Among its creations: Connect@Lunch, a system to connect people for internal networking at Eli Lilly and Co., and an interactive science lab for the Indiana Dental Association to show how sugar rots teeth. But now they’re venturing into the tabletop market with a World War II-based card game called Last Front, and they hope to raise $10,000 via a Kickstarter campaign to coincide with Gen Con. That’s a common strategy for game makers. Plowgames hopes to follow in the footsteps of Action Phase Games, an Indianapolis-based company that in 2014 found 2,000 backers to pony up a total of $138,000 for its first game, Heroes Wanted. It launched the game—and doled out incentives to backers—at last year’s convention. This year, Action Phase will double its booth space and offer the original game plus a Heroes Wanted expansion. “I would contribute a large part of our success to going to Gen Con,” said Nick Little, co-owner of Action Phase. Its game ranked at the top of the BoardGameGeek blog’s “Hotness” list for three days during Gen Con, driving so much interest that when Heroes Wanted became available to distributors two weeks later, the company sold out all 1,650 copies. Unlike Action Phase, Plowgames didn’t sign on to be one of the 412 exhibitors at Gen Con this year—primarily because it doesn’t yet have a product to sell (besides, such vendor spots were sold out by the final days of the 2014 convention). 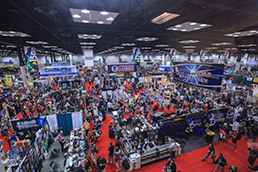 While the bigger players dominate the vendor hall and the tournament areas, startups are more likely to be found in Gen Con’s First Exposure Playtest Hall, where the publishers pony up $250 for four two-hour blocks of time, rather than attendees paying to play, as they do elsewhere at the con. Plowgames’ Last Front is, in essence, a bidding game where players try to build up the strongest set of battle cards to win territories. On a turn, a player can up the military force (via cards featuring troops, tanks, planes, etc. ), add an icon card (Gen. Patton will increase the value of your tank cards), or play special cards to change the circumstances (Typhus Outbreak forces an opponent to discard all troop units). The game, the result of two years of play testing, features prominent World War II figures and period artwork. “Hopefully, it will expose people who only know ‘Saving Private Ryan,’” said James Vining, project manager for Last Front. Great game play is essential to a successful game. But marketing and strategic business decisions are also important. Finding the sweet spot where cost and quality intersect, correctly estimating demand for the game, scoring good reviews by such influencers as Dicetower.com and boardgamegeek.com, are vital. Small companies also risk being lost amid the bigger Gen Con players, who pay as much as $75,000 for a co-sponsorship. It offers a “ribbon quest” program that creatively encourages attendees to sample games they might not otherwise have played. The goal isn’t just to push retail at the convention, but to drive customers to local gaming stores for year-round sales. • Gen Con is a consumer event. Most people attending come to play, some to buy. Make sure you encourage consumers to buy from their neighborhood game store. • Love your product and make sure the consumer knows it. • Take criticism with a grain or block of salt, but do not be blind. • Prepare your market. Make noise before the party. If they do not know you, most of them will never find you.